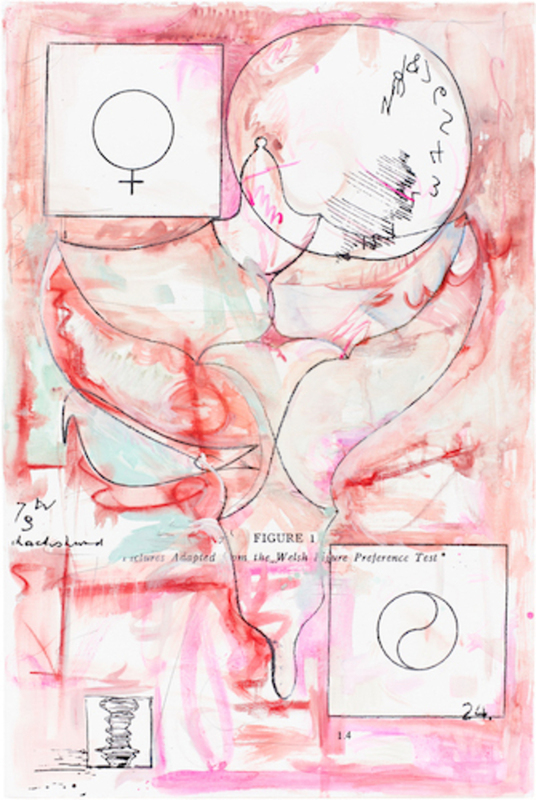 Sofia Leiby, Daschund (Welsh Figure Preference Test, D. W. Winicott Sketches, Neurological Clock Test and Medallion Test), 2016, watercolor, graphite, chalk pastel, and silk-screen on linen, 60 x 40". Sometimes the insecurity of youth is palpable: Who am I? What do people think of me – of my art? With her first solo exhibition in Germany, “The Making of a Beyonder,” Sofia Leiby exposes this uncertainty and critiques the anxiety associated with the judgment of artists. Using a 1960s-era measuring device called the Torrance Test of Creative Thinking, designed by psychologist E. Paul Torrance, Leiby combines silk-screen printing, watercolor, gouache, and graphite to reproduce and embellish images from this test. Morning Sunrise (Barron-Welsh Art Figure Preference Test, D. W. Winicott Sketches, Janusian Imagery, Unattributed Intelligence Drawing Tests) (all works 2016) is a black-and-white monochrome canvas that replicates an unattributed intelligence drawing test where mountains, dead bodies, and the morning sunrise have been depicted within square boxes. Overlaid are crude acrylic drawings of ducks and spirals, which disrupt the organizational space of the composition and its prescriptive instructions. Similarly, Daschund (Welsh Figure Preference Test, D. W. Winicott Sketches, Neurological Clock Test and Medallion Test) depicts washes of bubblegum pink, pale green, and scarlet red interrupting the assessment’s parameters. The exhibition’s most successful paintings are Read-A-Mat #9 and #10, which incorporate children’s educational placemats. In the latter, a methodical grid that describes color by way of fruits––red tomatoes, yellow lemons, orange carrots––is almost unrecognizable, obscured by a frenzied mass of grays, reds, and blues, dissolving any underpinning order. Channeling the coloration of Wassily Kandinsky and the psychological intensity of Edvard Munch—her Two Faces (Thematic Apperception Test Series D) is strikingly reminiscent of Munch’s Vampire, 1893–95—Leiby seems to confront the viewer with a preemptive response to any systematic perspective, refusing to stay within the lines.